In spite of a Twenty20 series defeat to Afghanistan, Gary Wilson feels Ireland will still enter the three One Day International’s this week at Stormont full of confidence. Ireland have won four of the last seven 50 over games against their opposition, and will be looking to further extend that when they face off on Monday, Wednesday and Friday (10:45am start). The last time they met was in the 2019 World Cup qualifiers in Zimbabwe, which Afghanistan won by five wickets to book their place in the showpiece event which is held in England and Wales next year. “We do know that ODI is a different form of the game and we do have a better record against them in ODI cricket as well,” said Wilson. The Twenty20 series in Bready has marked Wilson’s third in charge since he took over the captaincy full-time from William Porterfield. Ireland sit bottom of the world Twenty20 rankings, but Wilson sees this as a journey towards the 2020 World Cup qualifier which comes in the latter part of 2019. “I was very proud when they asked me to do it and I have enjoyed it so far but we need to start winning games as well. “We said at the time that it is a bit of a process in Twenty20 cricket, and when you have a World Cup qualifier in October of next year, that is always going to be the most important thing and it’s a bit of a journey until then. “We aren’t going to keep doing the same thing if it isn’t working, so there might be a bit of experimenting to see if we look at different combinations and different players. We have to find a formula and it’s a journey to find that. Rashid Khan has shown his class again in the Twenty20’s, and it won’t get any easier for the Irish when it comes to the ODI’s, with the 19-year-old ranked as the world’s second best bowler in the format. 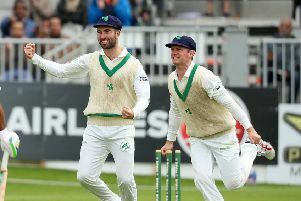 Ireland have tried to implement a plan of sweeps and reverse sweeps against the leg-spinner, and Wilson believes that plan is their best way to achieve success. “If you look at the way Rashid has bowled over the past 12 months, when people have been successful against him it has been with sweeps and reverse sweeps, and the odd shot straight down the ground. “I think it becomes very difficult when you try to knock him into the off-side and leg-side and not quite pick him. The best players in the world struggle to pick him. “If you look at the way he got MS Dhoni out in the IPL, it was trying to knock into the off-side or leg-side. Batsmen all over the world have been trying to figure Khan out in the past 12 months without much success, and Wilson gives credit to him for going away and working on different parts of his game. “He’s hard to pick because he gives you very little cues in his run-up or his delivery about what way the ball is going to spin. “You can usually find something that looks a bit different even if you aren’t necessarily picking a bowler. With Rashid, everything is a bit quicker. “He bowls 8/10 miles per hour quicker than most leg spinners. There is a lot of arm movement in his run-up, and we did have a cue for him. 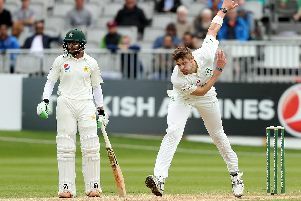 “Sky Sports even showed that he holds his googly slightly different to his leg-spinner, and he used to telegraph that quite a lot 12-18 months ago. When we played against him in Noida, we got that cue and started to pick him pretty well. “He’s obviously caught onto that now because if we caught on to it, then other batsmen around the world would have as well. “We have to look for something new now, and that’s international cricket. Wilson has now played county cricket for a decade with Surrey and Derbyshire, but with Irish players set to be classed as overseas from next season, that route won’t be as readily available to our younger generation. With his schedule, the 32-year-old has only been able to play in two Northern Knight’s matches, but he believes there needs to be more Interprovincial games. “I think there has to be more games or more days of cricket. “It all comes down to budget, money and all the things that are incredibly difficult to organise. “To only play each side twice in the three forms probably isn’t enough. We need to find a way of getting volume into the guys because in county cricket you are playing day in, day out pretty much. “It’s been such a hotbed for Irish cricketers in the past. We have benefited so much from being over there, and we have to try and get that. The skill level isn’t going to be the same for the first few years.